You are so good at your job that I will keep you indefinitely in that position, without new and challenging tasks! Sometimes is hard for an employer to let their best team members try new things, just because they now at what tasks they can excel and bring value to the company. But even a guru in a specific area needs, from time to time, new and exciting challenges. Things he or she doesn’t know how to do right away. Recognize good work with new responsibilities and confidence they can do an amazing job out of their comfort zone. You didn’t know you were making things wrong? I frowned a lot, you should’ve noticed. Don’t be that kind of boss that doesn’t give continuous feedback to your team. Don’t wait until the (boring) annual performance review to let your employees know what they are doing wrong. Give them hints; guide them through the mistakes they will naturally make. Don’t expect your team to know everything and to acknowledge by magic if you are happy or not with their work. Give them feedback and promote a culture where they are comfortable to ask you about your opinion on their job. That’s a dumb idea you have there! There are no dumb ideas… wrong! Of course, they are! We all know that sometimes everyone drops a stupid idea in a brainstorming, in a meeting or at the coffee machine. Keep it calm and don’t destroy the idea right away, try to know the reasons behind it. If you shut down all ideas, your team will be afraid to present you new ones. And you never know, when after a ridiculous idea comes a great one that can change the game. Be subtle when rejecting ideas, especially if more than one in a row coming from the same person. Micromanaging is a b**ch. When you want to review everything an employee just did, you are thinking you are passing an image of da edicated boss but in fact ,you are saying you have trust issues. Let the creativity and sense of responsibility flourish inside your team, let them make decisions. Let them make mistakes. I’m busting my a** off! Yeah… nobody cares. Don’t bring your problems to the team. Don’t try to make them feel sorry for you. You are the boss; you have a better paycheck so you should be busting it off. Don’t bring that kind of negative energy to the team, you should be the one they look up as the one that can get stuff done. That can solve their problems and that is able to keep it all together. They are probably working hard, figuring out new things all week, they don’t need to know about your problems. It’s hard, I know, that’s why you are the boss. Employee recognition and appraisal have a lot more results in terms of motivation if they are done in public. People live for the applause and want their peers to see their achievements. Big, big, big mistake. Don’t ever criticize a team member in public (especially if you are the kind of boss that congratulates in private). If an employee needs to be lectured, use that beautiful ssoundproofoffice you just bought. Don’t try to make examples to the whole team by stating what a specific person did wrong, in front of all the staff. It’s hard to receive criticism and to transform it into fuel for motivation and change, but if you do it properly and in private, you have better chances of achieving that. Happy birthday! I have this gift for you: spoiler alert, it’s a report to be on my desk by the end of the day. 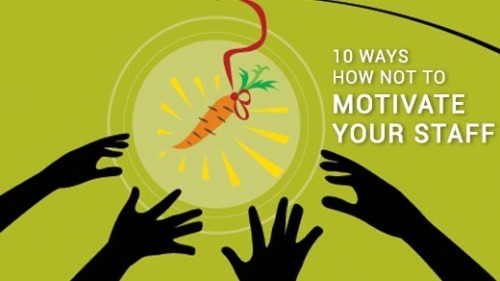 Little things can boost employee engagement and motivation. Nowadays, people spend their birthday responding to text messages and replying with “Thank you” to Facebook posts from people they don’t even remember. So, why not give the day off to the birthday boy or girl? What harm can it bring to the company to give a vacation on this special day? Try it. They will come the next they with higher motivation and drive to run the extra mile. Don’t change your mind every two seconds. Don’t assign tasks or projects that will be thrown in the garbage right away. One of the main reasons of lack of motivation at work is to feel that your work is not valuable and you are not being recognized for what you do. What can be worse of seeing that perfect presentation you were working all week to go the garbage bin because your boss changed minds and decided to go on another route instead? Yes, of course ,it can happen and your team must be prepared for it, just try it minimize the damage. You want a raise? Better start working late. If you try to squeeze every drop of juice from an orange, you will eventually get some parts of the skin that don’t taste good. With your team, it’s the same way. If you try to take it all, without giving something, you will end up with a tired and demotivated team. Don’t make assumptions that working late every day is an obligation or an expected objective to be fulfilled in order to get a promotion or a raise. If you want a great team, make them fill that you care about their personal and social life and recognize their efforts during the work hours in their contract. With TapMyBack you can boost your employee recognition and engagement and build stronger teams. This simple app software boosts your staff motivation through the power of peer-to-peer recognition and continuous feedback. Try it out, it’s free.